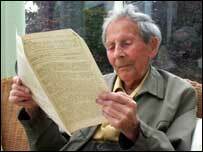 Donald Watson the founder of The Vegan Society and the man who created the word vegan has died a few months after his 95th Birthday. Donald died peacefully at his home in the Lake District whilst Janet his daughter and Joe Connolly, editor of Veg News, were at his side. Joe said "Donald appeared to be totally at peace and was chatting philosophically and optimistically until shortly before he passed away"
Donald Watson had taken a back seat on running The Vegan Society shortly after he handed power over to committee fairly early on in it's history. He kept an eagle eye on everything that was going on however and watched with admiration as it grew into a worldwide movement with vegan societies in every corner of the world and exciting vegan alternatives for everything from Ice cream to caviar. For his 95th birthday this year (2005) Donald spoke to millions of people via the BBC World Service. "The genie is now out of the bottle and no one can ever put it back to the ignorant days before 1944, when this seed was planted by people full of hope. Now wherever Man lives he can have a vegan diet." Have you seen the 100th Monkey? Vegetarian Omega 3 DHA EPA Buy Now 3 for 2! PeaPR Foods for Life. Awesome Inc. theme. Powered by Blogger.